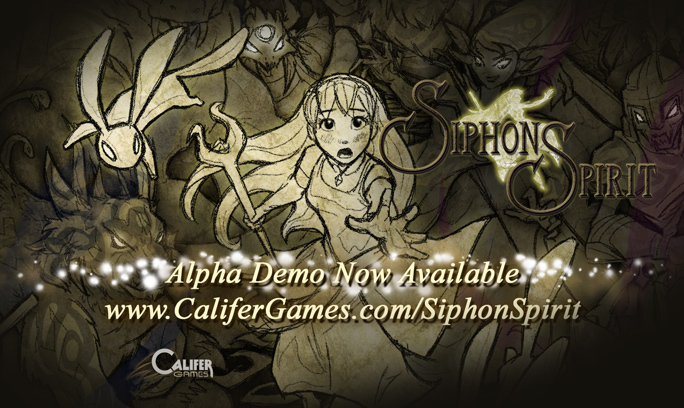 Califer Games: The Alpha Demo is Live! Sorry for the wait! It's now live and ready to be played. Currently it's only a Windows build. Pop by the forums to let us know what you liked and what you didn't. I've been pushing hard to get another version of the demo out. It will still be a while, since it's going to include the level editor. It's also going to have a redesign in how the levels are saved out, so that's going to be a big change. Hopefully I'll have something to post about it soon. Will you be restricting the level editor in the demo in any way? It seems like the level editor would represent the largest chunk of your replay value. I'm guessing Siphon Spirit will be heavily story driven, and perhaps that is what you are trying to sell rather than replay value, but it seems that including the level editor in the demo may actually prevent some potential consumers from feeling the need to buy the game once it's completed. The level editor in the demo will contain, at the most, only the gameplay elements and art that are included in the demo. Any advanced demon orbs, new spells, mystical runes, etc will only be usable from the full version editor. Also, all demo versions will be unable to load custom levels that include elements that the demo version cannot create. Is this a good idea? I'm not entirely sure. I have been concerned about players that would just make new levels with the demo and not get the full game. Maybe I should find another way to limit it as well. Thanks for the good question and please ask again if something else comes to mind! Assuming "Is this a good idea?" is not entirely rhetorical, I think so. You're giving them a taste of the level creation, and if they like it they will want more, which will apparently come from the full game.